Our 30K platform has a 12.5 wide by 27.5 long live weighing area and can be used width wise or length wise. Our large jet platform system is based on our new 30,000 lb platforms. 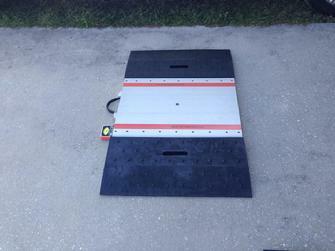 Each platform has a 12.5 wide by 27.5 long live weighing area and comes with hard rubber ramps. Each platform weighs in at just 80 lbs and they are available in wired or wireless configurations. 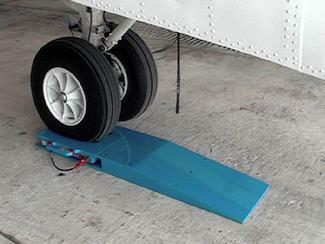 Platforms can be used width wise as shown for dual wheel corporate aircraft or, add platforms to the wireless system and increase to 5 platforms used length wise for the A320 or 737 type aircraft. The live weighing area is 12.5 wide by 27.5 long. Measure your tire profile front to back and determine its foot print as shown. The tire contact patch must be less than 12.5 inches to be used width wise. For both wheels, the length must be less than 27.5 inches. 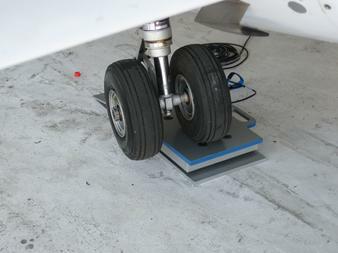 In the picture above, the tires were more than 27.5 inches wide (Boeing 737) this will require two platforms, one under each wheel. Our new 30K platform can be used length wise as shown for large single wheels or use two platforms side by side for large aircraft like the 737 or A320. Here you can see the room on the platform. Our live weighing surface is 12.5 inche wide by 27.5 inches long. As you can see here, we had room for chocks to be used. Here is a dual wheel nose configuration. Our platforms can be used for other dual wheel applications as long as the width from tire to tire outside is not more than 27.5 inches. These platforms are also offered in a 10,000 per platform configuration, a 20,000 lb per platform configuration or a 30,000 lb configuration. Wireless aircraft weighing on platforms is now possible with our M2400-3-10KP system, currently only $7495.00. Truly wireless, 150 ft range, cells are powered by standard AA batteries and the computer is powered by the laptop battery. Cell battery life is over 1 year, laptop can operate up to 3 hours with out being plugged in. Standard platform is 12 inches wide, by 16 inches long by 3 1/4 inches tall. This size is easy to move and ship, captures most aircraft tire sizes in the range of 10,000 lbs and is just high enough that duel wheel aircraft can have a single wheel hang off the side and have ground clearance. Capacities are available in low end configuration 0 to 200 lb for UAV/UAS, 0 to 2000 lb for light use, 0 to 5000 lb, 10,000 lb or up to 15,000 lb sets. Note: not all part numbers are shown on the web site, call us for detailed part number systems offered. 6061 billet cut aircraft grade aluminum construction, duel double ended shear beam construction makes our platforms stand out from all others. Concentrated center of force path between our shear beams produces the most accurate high and low weight capacity scale you can use for aviation applications, including low end weight for UAV/UAS applications. Platforms come with 30 inch long wood plank ramps with a 7 degree incline for easy pull up. Wooden plank construction yields high strength and low weights for shipping and relocating the ramps, thus reducing shipping costs. Kits are available in both wired and wireless configurations. Our system can also be grown into a much larger system for higher weight aircraft, just purchase two sets and use the platforms side by side for 6 wheel applications requiring full weighing in draft. Wireless platforms, no more wires, just the platform, computer and antenna. Small aircraft, small turboprop and small jet aircraft platforms. 5000lb 10,000lbs and 15,000lb platforms are available. 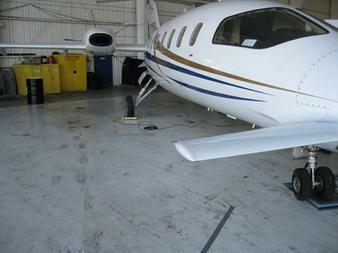 Light turboprop, up to King Air size aircraft are capable to be weighed on our platform system. Dual wheel applications are not a problem, our units are just high enough that one wheel will hang off the scale with the other centered. This feature is not offered on other scales that are low profile and cause you to purchase additional platforms for dual wheel applications. Portable, compact and wireless, just add your aircraft! Computer is a standard 15.6 inch running Win8 and we will soon be releasing our Win8 tablet version! All our platforms are now shipping with our new light weight plank construction wood ramps. The wooden plank ramps are superior in weight capability and we found that they grip the floor better in high gloss floor hangers. Old school? No problem we have our standard M2000 wired system for you! New School? If you into tech or just want the latest weighing system we have you covered on that as well. Soon our new Win8 tablet will be out! Our double ramp and platform system for the Sikorsky S-92 shown here with our plank wood ramps for light shipping weight and heavy weight aircraft application. Our new JAWS 10KP platform is made of 6061 billet cut aluminum. All platforms are machined to close tolerance and have a hammer tone finish for long service life. 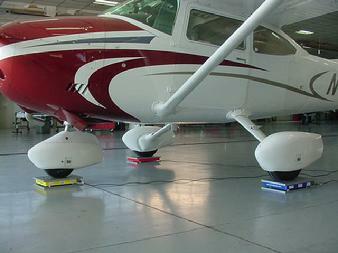 Cessna aircraft with no jack points are no problem with our roll on platforms. System works for all small aircraft, Beechcraft, Piper, Diamond and lots more! Cessna 182 on our platform system, this scale set is a must for the IA, A&P, small repair stations, avionics shops, paint and interior shops. Don't guess at the weigh or take the log book entry that is 20 years old for granted, one pass on the scales will give you the actual weight. Our JAWS 10K platform is great for small aircraft up to light jets. This platform is solid cast aluminum and features an on board battery and built in digital indication. Master platform and two slave platforms come complete and ready to go right out of the box.